Haratani T., et al. Effects of Transcendental Meditation (TM) on the mental health of industrial workers. Japanese Journal of Industrial Health 32: 656, 1990. Orme-Johnson, D. W., & Barnes, V. A. Effects of the Transcendental Meditation technique on Trait Anxiety: A Meta-Analysis of Randomized Controlled Trials. Journal of Alternative and Complementary Medicine, 19, 1-12, 2013. Rees B, Travis F, Shapiro D, Chant R. Reduction in post traumatic stress symptoms in Congolese refugees practicing Transcendental Meditation. Journal of Traumatic Stress. 2013:1-14. Rosenthal JZ, Grosswald S, Ross R, Rosenthal N. Effects of transcendental meditation in veterans of Operation Enduring Freedom and Operation Iraqi Freedom with posttraumatic stress disorder: a pilot study. Military Medicine. Jun; 176(6):626-30, 2013. Schneider R.H. Altered responses of cortisol, GH, TSH and testosterone to acute stress after four months’ practice of Transcendental Meditation (TM). Annals of the New York Academy of Sciences 746:381-384, 1994. Sedlmeier, P., Eberth, J., Schwarz, M., Zimmermann, D., & Haarig, F. The psychological effects of meditation: A meta-analysis. Psychological Bulletin, 138(6), 1139-1171, 2012. Castillo-Richmond A., et al. Effects of the Transcendental Meditation Program on carotid atherosclerosis in hypertensive African Americans, Stroke 31: 568-573, 2000. Paul-Labrador M., et al. Effects of randomized controlled trial of Transcendental Meditation on components of the metabolic syndrome in subjects with coronary heart disease. Archives of Internal Medicine 166:1218-1224, 2006. Herron, R. E. Changes in Physician Costs Among High-Cost Transcendental Meditation Practitioners Compared with High-Cost Non-practitioners Over 5 Years. American Journal of Health Promotion 2011; 26(1): 56–60. Herron R. E. Can the Transcendental Meditation Program Reduce the Medical Expenditures of Older People? A Longitudinal Cost-Reduction Study in Canada. Journal of Social Behavior and Personality 2005; 17(1): 415–442. Herron, R. E., Hillis, S. L. The Impact of the Transcendental Meditation Program on Government Payments to Physicians in Quebec: An Update. American Journal of Health Promotion 2000; 14(5): 284–291. Orme-Johnson D. W., Herron R. E. An Innovative Approach to Reducing Medical Care Utilization and Expenditures. American Journal of Managed Care 1997; 3: 135–144. Herron R. E., et al. The Impact of the Transcendental Meditation Program on Government Payments to Physicians in Quebec. American Journal of Health Promotion 1996; 10: 208–216. Herron, R.E., et al. Cost-Effective Hypertension Management: Comparison of Drug Therapies with an Alternative Program. American Journal of Managed Care 1996; Vol. II(4): 427–437. Orme-Johnson D.W. Medical Care Utilization and the Transcendental Meditation Program. Psychosomatic Medicine 1987; 49: 493–507. Badawi K., et al. Electrophysiologic characteristics of respiratory suspension periods occurring during the practice of the Transcendental Meditation program. Psychosomatic Medicine 46(3): 267–276, 1984. Dillbeck M. C., et al. Frontal EEG coherence, H-reflex recovery, concept learning, and the TM-Sidhi program. International Journal of Neuroscience 15: 151–157, 1981. Gallois P. Modifications neurophysiologiques et respiratoires lors de la pratique des techniques de relaxation. L’Encéphale 10: 139-144, 1984. Lyubimov N.N. Electrophysiological characteristics of mobilization of hidden brain reserves. Abstracts, the International Symposium “Physiological and Biochemical Basis of Brain Activity” (St. Petersburg, Russia: Russian Academy of Science, Institute of the Human Brain): 5, 1994. Yamamoto S., et al. Medial prefrontal cortex and anterior cingulated cortex in the generation of alpha activity induced by Transcendental Meditation: A magnetoencephalographic study. Acta Medica Okayama, 60(1): 51-58, 2006. Alexander C.N., et al. Growth of higher stages of consciousness: Maharishi’s Vedic psychology of human development. in Charles N. Alexander and Ellen J. Langer (eds. ), Higher Stages of Human Development: Perspectives on Adult Growth. New York: Oxford University Press, 1990. Alexander C.N., et al. Effect of Practice of The Children’s Transcendental Meditation Technique on Cognitive Stage Development: Acquisition And Consolidation of Conservation, Journal of Social Behavior and Personality, 17, 21-46, 2005. Seeman W., et al. Influence of Transcendental Meditation on a measure of self-actualization. Journal of Counseling Psychology 19: 184-187, 1972. Geisler M. Therapeutische Wirkungen der Transzendentalen Meditation auf Drogenkonsumenten. Zeitschrift für klinische Psychologie 7(4): 235–255, 1978. 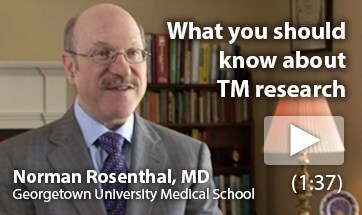 More than 380 peer-reviewed research studies on the TM technique have been published in over 160 scientific journals. These studies were conducted at many US and international universities and research centers, including Harvard Medical School, Stanford Medical School, Yale Medical School, and UCLA Medical School. 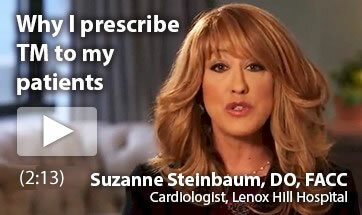 Circulation: Cardiovascular Quality and Outcomes, November 2012, a journal of the American Heart Association: 5-year randomized controlled study on patients with established coronary heart disease reported a 48% reduction in death, heart attack, and stroke in subjects in the TM group compared to controls. Hypertension, June 2013: a scientific statement from the American Heart Association concluded that the TM technique is the only meditation practice that has been shown to lower blood pressure. Journal of Alternative and Complementary Medicine, October 2013: Meta-analysis of randomized controlled trials (RCTs) found significantly greater effect of TM in reducing trait anxiety than treatment-as-usual and other alternative treatments, including mindfulness-based therapy (MBT) and other meditation and relaxation practices.